HISCAN can easily be integrated with existing structure without any major modification. Category: Scanners. Tags: Adhesive tapes, Biax extrusion, Blown film, Cast film, Coating & laminating, Composites, Extrusion coating, Nonwovens, Paper, PVC calendering, Rubber, Sheets & foils. HISCAN is an automatic scanning “O” frame unit to measure in transmission mode. 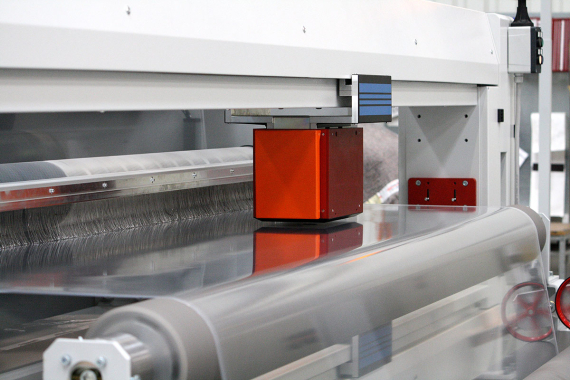 HISCAN is an automatic scanner with a smaller footprint and optimal mechanical configuration. For this reason it was specifically developed for a large range of industrial applications and production lines. The HIGHSCAN “O” frame is composed of two solid IPE beams, fastened to the stainless steel terminals. The solid sliding carriage device, which can house up to two sensors, is driven by linear guides with limited support elements and sliding sleeves. The scanning speed is adjustable and the sensor is positioned to ensure high accuracy.